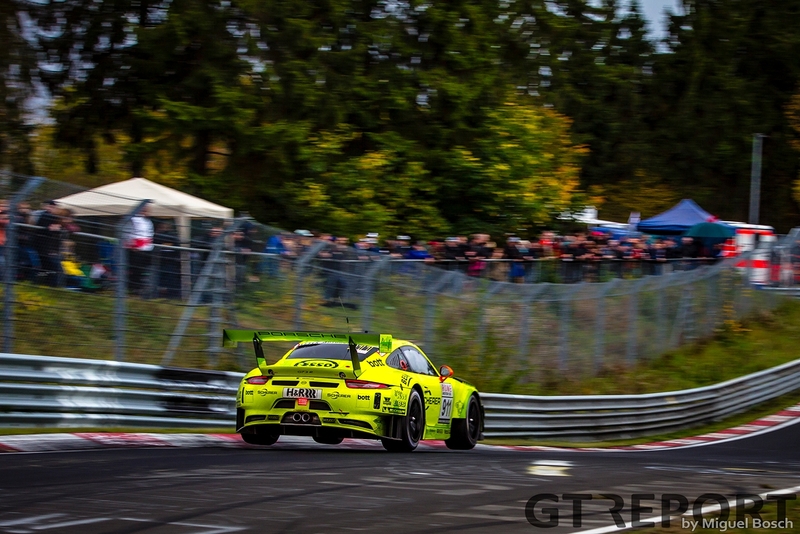 In the same fashion the 2017 VLN season started, it ended: with Manthey Racing on the top of the podium. 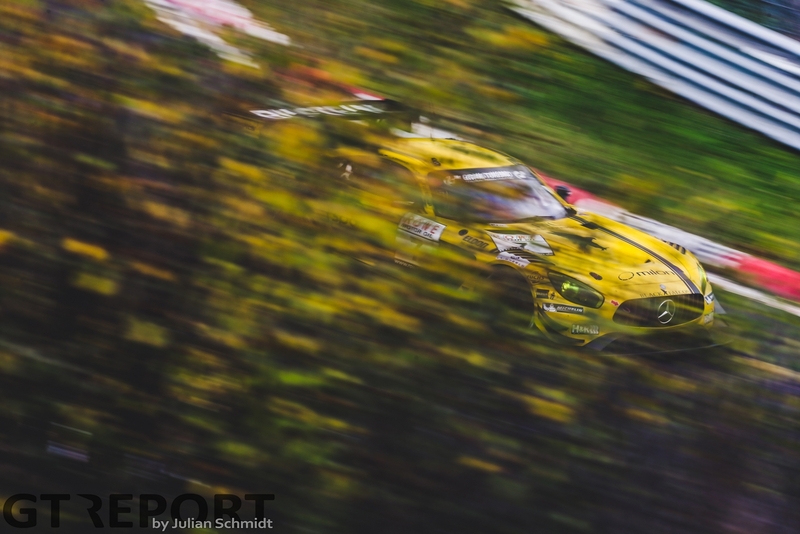 The dominating Porsche 991 GT3R team goes into the winter as the undisputed kings of the Nürburgring, claiming their fifth victory after a four-hour-long dogfight with Mercedes-AMG’s Black Falcon squad. 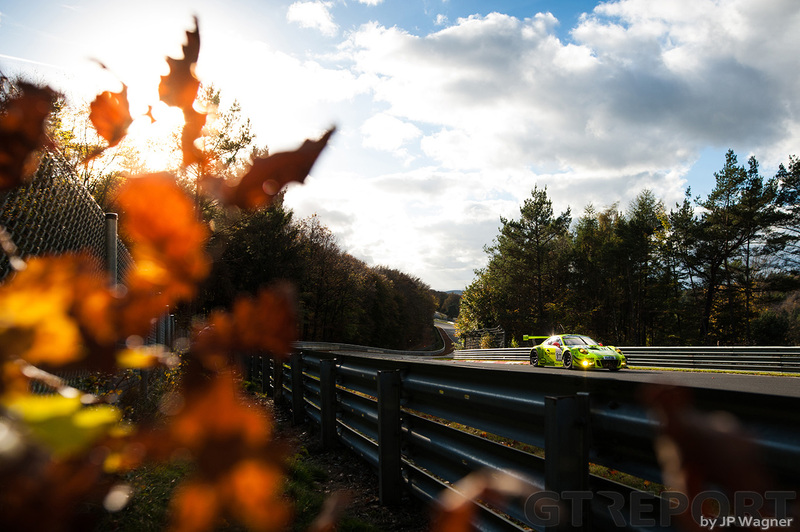 Truly on fire in the closing months of the racing season, Robin Frijns has established himself this year as a go-to man for Nordschleife glory. 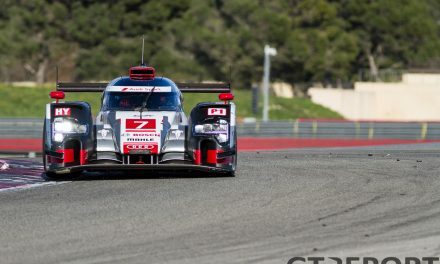 The Audi works driver won in his last outing in the Eifel and in the morning of the 42. DMV Münsterlandpokal scores pole position with a sub-8-minute lap around the cold and damp Nordschleife, placing the Phoenix Racing Audi R8 LMS GT3 on the front row of the starting grid. Alongside the Phoenix Audi, however, the ever-strong Manthey Racing Porsche 991 GT3R, or Grello as the green and yellow racer is caressly nicknamed, is surrounded by a small army of Porsche Motorsport and Manthey Racing personnel. Among them stand pilots Fred Makowiecki and Lars Kern—another all-star formation from Weissach has been entered for the season finale. Manthey Racing is given no gifts at the start: Frank Stippler flies into the first corner and onto the Nordschleife in first place. Makowiecki can only follow, but does so from a close distance. Through the endless wet and damp turns of the Nordschleife Makowiecki stays close, pressing Stippler for a way through. The veteran Audi pilot gives in when he goes in a fraction too deep at slippery the exit of Brünnchen. Makowiecki doesn’t need another invitation: into Eiskurve he slingshots himself around the outside of the Audi. 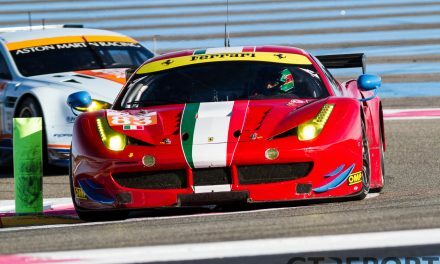 Until the end of the first stint Manthey Racing carries the lead, running away from the rest of the field with only the Falken Porsche—having steadily climbed up from sixth to second in the opening laps—able to keep up. Black Falcon deems the time right after three completed laps to switch to intermediates as the track is slowly drying. Hubert Haupt has held his own amongst the clash of world class drivers he has found himself in during the first laps, but is pulled out of the fight to make use of a shorter minimum pitstop time and a clear track ahead. It might be the perfect call, their ticket to victory, but the AMG troops will have to wait and see how the race progresses to be sure. What is certain, is that the earlier pitstop saves Black Falcon valuable seconds having to wait in pitlane for the minimum pitstop time to tick away. The shorter stop and extra lap in the perfect weather conditions for the chosen rubber hands Haupt the lead over the others after their pitstops, including Manthey who now are the hunters. Makowiecki draws closer to the back of Haupt near the end of the second stint, making up for ground lost in the first pitstop. 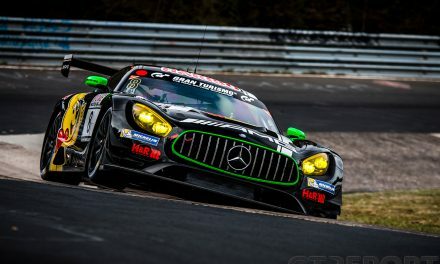 Haupt, however, has just enough pace to enter the pits in front of the stalking Grello and hands over the steering wheel to AMG superstar Maro Engel. 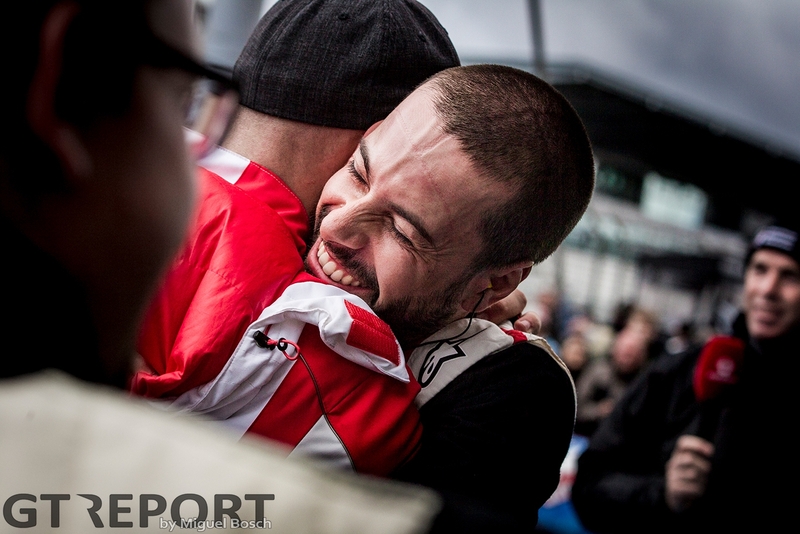 In the lap thereafter Makowiecki makes place for Lars Kern. It’s the Porsche test and development driver’s first turn at the wheel of the top-car in competition. The only non-works driver this year to do so in the number 911 Porsche, Kern’s latest Nordschleife lap record in a production Porsche 911 GT2 RS earned the cult hero this drive. But this is different. There are no hot laps today; all that counts is track position. And if there’s anything that Engel excels at, it’s fighting tooth and nail with whoever stands in his way. After a little hiccup taking off—Kern stalls the car, losing time and the chance to grab the lead—Grello returns to the battlefront. The Porsche team is still chasing Black Falcon, but with their high-paced pursuit and the absence of rain despite the dark skies and scarce Code 60s throughout the day, the race is pushed to go 28 laps: one too many for Black Falcon to go the distance with just one more stop. 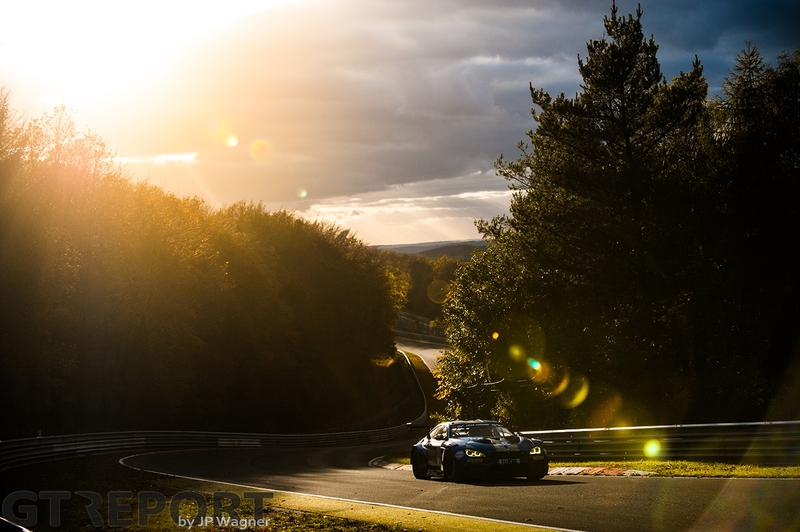 Meandering the traffic on the Eifel mountain course, Kern follows Engel, reeling him in and letting him go, catching up again near the end of the second-to-last stint. Into the final hour Manthey regains the lead. A quick pitstop—again a lap after Black Falcon, who replaced Engel with Erik Johansson—wins Makowiecki the front position. Eriksson is about 10 seconds behind the Porsche, but needs to double-time it to secure second place. The 21-year-old Swede knows he’ll have to come in on the final lap. Tagging along with Makowiecki, Johansson wins himself enough seconds to keep the unleashed Robin Frijns—unconcerned with traffic, the Dutchman throws down another sub-8-minute lap—behind after the splash-and-dash with the end in sight. Easing off for the last leg through the Eifel, Makowiecki brings Grello home for Manthey’s 50th victory. It’s a journey that began in 1996 with three-time VLN champion Olaf Manthey at the helm and has since grown into a fan-favourite, Porsche-owned works squad—one of the defining teams in all of motorsports. It takes almost a minute for Eriksson to follow the Manthey Porsche across the finish line, while the wait for Frijns takes another 18 seconds, underlining Manthey’s superiority once more. 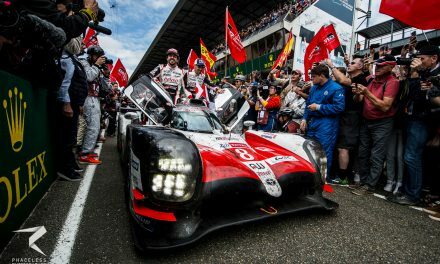 With five victories out of nine races Manthey closed the year with the same display of power it opened with. 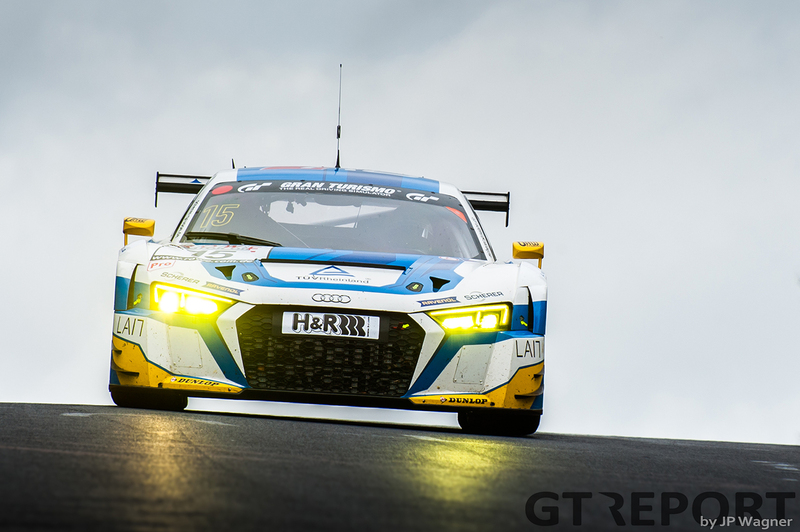 The search to get more out of the car, nevertheless, persists: it’s what brought Grello out of the SP9/GT3 class and into SPX when the team went looking for better engine cooling to squeeze even more out of the Stuttgarter grand tourer. Manthey Racing will be back next year. Will anyone break them come spring?